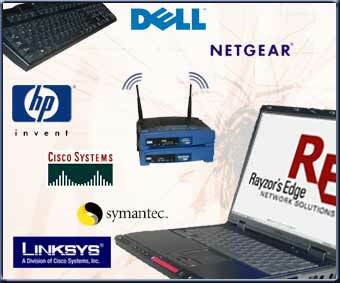 Rayzor's Edge does not maintain an inventory of computers or parts except parts needed for common repair services. With the proliferation of Internet resellers at or near wholesale prices, we maintain excellent business relationships with many different vendors and suppliers and use these resources to get you the best pricing for all products. All products come with the manufacturer's warranty. We only use reputable vendors and we never use online auction resources like eBay for any business critical component! We will customize your computer network or computer to meet your needs. Configurations vary from multi-processor servers to high-end workstations for Engineers running 3D-CAD software to basic units for email and Internet only. If you prefer to maintain brand loyalty, we work with the vendor to get the best possible pricing. Give us a call and let us help you save money on your next purchase of hardware or software!